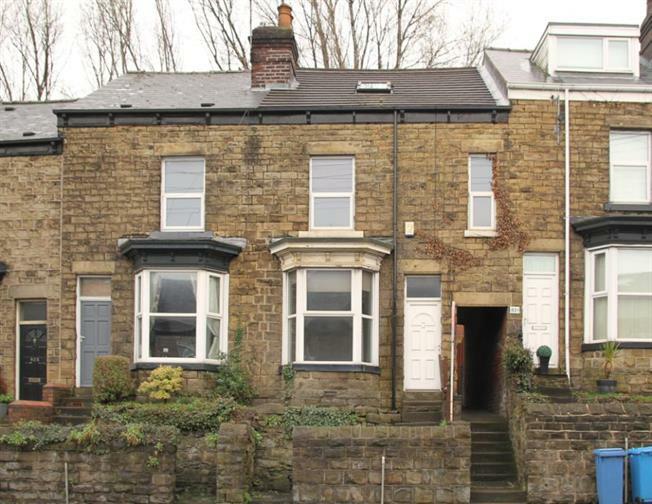 5 Bedroom Terraced House For Sale in Sheffield for Guide Price £215,000. Offering substantial living accommodation over Three floors is this spacious FIVE BEDROOM Bay Fronted Victorian Mid Terraced property ideally situated on the ever popular Ecclesall Road. Having recently undergone a degree of modernisation throughout including a newly fitted kitchen, shower room and gas heating boiler and benefitting from accommodation over all three floors. Available to market have VACANT POSESSION AND NO ONWARD CHAIN the property may be of particular interest to landlord/investors previously bringing in an annual 14400, alternatively first time buyers/young professionals due to the location within walking distance of Sheffield city centre, universities, principle hospitals and the fabulous amenities of Ecclesall and Sharrow Vale Road. The accommodation in brief comprises: well proportioned dining kitchen where there is an excellent range of recently fitted attractive wall and base units with roll top work surfaces and inset stainless steel sink with integrated appliances to include electric hob, electric oven and extractor fan above, along with space and plumbing for an automatic washing machine and dishwasher and original storage cupboards to one wall. Tiling to the splash backs, wood effect laminate to the floor and housed gas central heating boiler. A door accesses the cellar and a further door leads to the Inner lobby where stairs rise to the first floor landing and the Bay fronted Lounge. To the first floor are three bedrooms and a shower room which has been refurbished comprising of a wash hand basin, low flush wc, walk in double shower cubicle with tiled splash back and mains shower within, ladder towel radiator and wall mounted extractor fan. Stairs rise to the second floor landing where there are two further bedrooms and a WC/cloakroom. Externally: To the rear of the property is a low maintenance enclosed sitting area. Early viewing is highly recommended to appreciate the overall accommodation on offer.